EIA is today proud to host a guest blog by Julian Rademeyer, journalist and author of the must-read illegal rhino horn trade exposé Killing for Profit. Visit his website here. Vixay Keosavang is one of the most ruthless and prolific wildlife criminals operating in South-East Asia today. Some call him the “Pablo Escobar of animal trafficking”. Others describe him as the “Mr Big” of wildlife crime in Laos, the tiny one-party communist state bordered by Myanmar, China, Thailand, Cambodia and Vietnam that continues to harbour him. The criminal syndicate he oversees, dubbed the “Xaysavang network” after the name of an import/export company he established in 2008, has been implicated in the smuggling and slaughter of thousands of animals including pangolins, primates, reptiles, snakes, rhinos, elephants, lions and tigers. The US Government calls the Xaysavang syndicate “one of the most prolific international wildlife trafficking syndicates in operation” and, late last year, issued a US$1 million reward for information “leading to the dismantling” of the network. But despite this – and despite overwhelming evidence of its criminal activities – the network continues to ply its deadly trade and Vixay remains utterly untouchable, protected by the Lao PDR Government and the corrupt politicians and bureaucrats he has so ably cultivated. I spent two years investigating and documenting the syndicate’s involvement in the grisly trade in rhino horn and lion bones from South Africa. In the course of my research, I amassed hundreds of pages of documents including CITES permits, invoices and emails detailing Xaysavang’s activities. In all, Vixay’s name appeared just 16 times. He remained largely in the shadows, a distant puppet-master reaping the rewards of the killing but rarely dirtying his own hands. 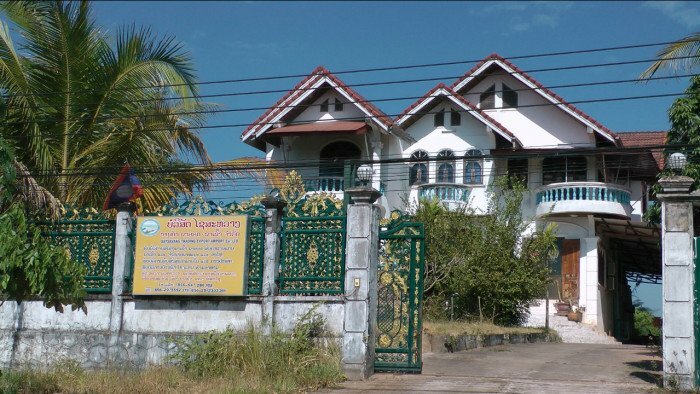 The tangled web of evidence led from South Africa to Kenya, Thailand, Vietnam and finally to a house in Paksan, a small town situated on the banks of the Mekong River in central Laos. A 2003 Thai police intelligence report on wildlife traffickers lists Vixay by name and includes some details of wildlife transactions in which he was involved. Four years later, a Vietnamese journalist, Huong Quoc Dung, published a series of articles on the illegal primate trade and unearthed documents showing that Xaysavang had exported more than 80,000 animals, including 7,000 monkeys, 13,000 snakes and 60,000 turtles. The monkeys went to a Vietnamese company called Trung Viet. Documents I obtained during my investigations shed light on other wildlife trafficking operations. One, dated March 2009, was a sales agreement between Xaysavang and a Vietnamese company called ThaisonFC. In terms of agreement, Vixay promised to supply the company with more than 100,000 live animals including 40,000 rat snakes, 20,000 monocellate cobras, 10,000 king cobras, 20,000 water monitors and 20,000 endangered yellow-headed temple turtles. The price: $860,000. In 2009, Kenyan customs officials seized 280kg of elephant ivory and two unmounted rhino horn “trophies” weighing 18kg. The consignment, which had originated in Mozambique, was on its way to Paksan and the Xaysavang Trading Export Import Company Limited. Late in 2011, an undercover team from the British Union for the Abolition of Vivisection (BUAV) visited a neglected farm on the outskirts of Paksan. It found 575 macaques in cages. They were starving. Many were on the brink of death and others lay dead in their pens. The farm belonged to Vixay. Elsewhere, other pieces of the jigsaw were falling into place. There were seizures in Thailand. The Bangkok-based Freeland Foundation, headed by Steven Galster, uncovered evidence which ultimately led Galster to conclude that Vixay is “the Mr Big in Laos”. “He seems so well-protected and we haven’t met any law enforcement officers in Laos who are able, or willing, to take this on,” he told me later. In July 2011, the South African Revenue Service dealt what was believed at the time to be a hammer-blow to the syndicate. Two of Vixay’s closest lieutenants, Chumlong Lemtongthai and Punpitak Chunchom, were arrested. 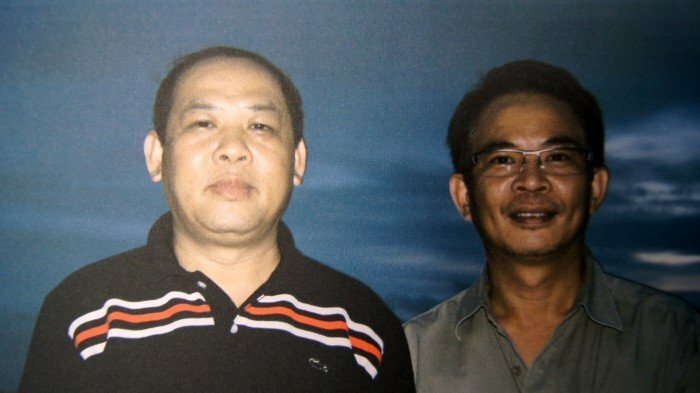 On Chumlong’s laptop, investigators discovered a treasure-trove of digital photographs, video footage and documents. It gave a unique insight into the activities of a transnational wildlife crime syndicate. 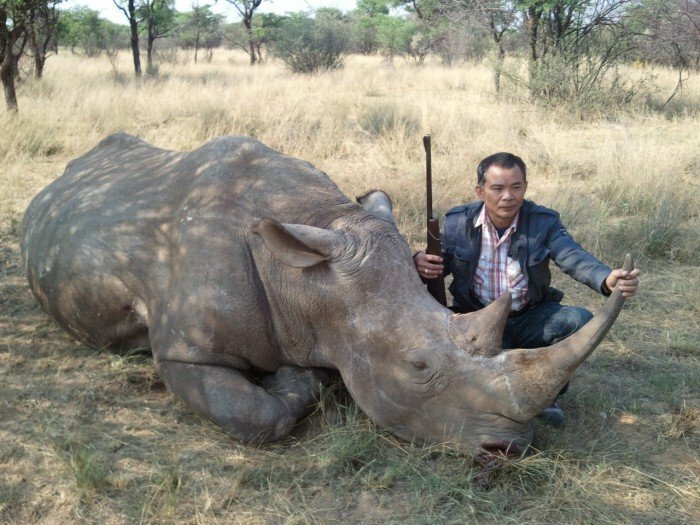 A key syndicate figure, Chumlong Lemtongthai, poses with the carcass of a rhino that he shot. The trophy was later shipped to Xaysavang Trading in Laos. Chumlong is currently serving a 30 year prison sentence in South Africa. The photographs and videos were hard to look at, graphically detailing the sham rhino hunts the syndicate had conducted to ensure a steady supply of rhino horn trophies to Laos where they would be cut up and sold for thousands of dollars. 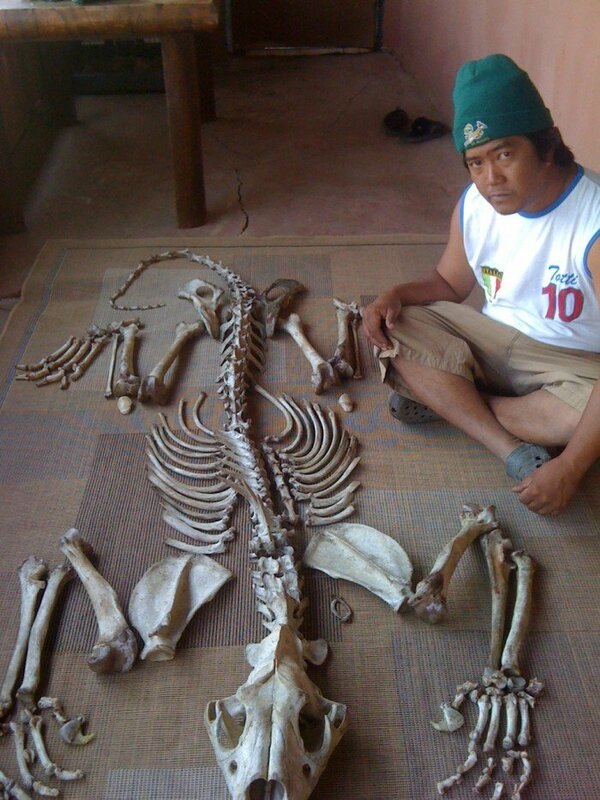 There were also images of lion carcasses being stripped of flesh for the bones. And there were photos documenting the pay-offs to South African game farmers who had thrown in their lot with the syndicate. One farmer posed for the camera with his wife and daughter, grinning stupidly over a huge pile of cash. Chumlong was subsequently sentenced to 40 years in prison. The sentence was reduced on appeal to 30 years. Charges against Punpitak Chunchom and two alleged accomplices, game farmer Marnus Steyl and a professional hunter, Harry Claassens, were withdrawn after Chumlong pleaded guilty and claimed they had no knowledge of the crimes. Punpitak quickly slipped out of South Africa and returned to Thailand. How he did so remains a mystery. His passport was still in the possession of the South African Police Service at the time. Today he is a wanted man, with an Interpol Red Notice hanging over his head. Steyl – who continues to maintain his innocence – was later rearrested and charged with 29 counts of fraud relating to the acquisition of rhino hunting permits and two counts of illegally hunting white rhinos. One of those instances was filmed by Chumlong with a GoPro camera. This week, Steyl approached a South African High Court to request a permanent stay of his prosecution. Should he fail to obtain it, he will be back in court in March. The initial joy over the arrests and convictions was short-lived. Like a hydra, the Xaysavang syndicate quickly sprouted other heads. In early 2013, the Freeland Foundation identified a young woman named Loy Chanthamvonga as Vixay’s possible replacement for Chumlong. She was linked to a rhino horn shipment smuggled into Thailand by a Vietnamese national. Two police officers were also implicated in the smuggling attempt and arrested, but Loy managed to evade capture. She speaks a number of languages, is believed to be the holder of both a Vietnamese and a Laotian passport and has travelled frequently to Mozambique in southern Africa. Since the US Government announced its $1 million bounty, the sign outside the house that once served as the headquarters of the Xaysavang syndicate in Paksan has been taken down. Vixay’s family still live there, but he is now believed to spend much of his time in the Laotian capital Vientiane. Compelling evidence gathered recently by Kenya-based wildlife crime investigator Karl Ammann suggests that Vixay is active in a tiger-breeding farm and receives “tons” of lion bones which are smuggled to Vietnam. There, in traditional medicine shops and back-alley dealerships, they are passed off as tiger bones. Vixay continues to boast to potential clients that he can obtain rhino horn, although he has said it is becoming increasingly difficult to do so. There are rumours too of his involvement in a bizarre scheme to smuggle heroin, concealed in consignments of dogs being trucked through Thailand and Laos into Vietnam. It seems astonishing, given the amount of evidence gathered, that the Xaysavang network is still in business. It illustrates the daunting challenge that exists in bringing transnational wildlife crime networks to book. Syndicates like the Xaysavang network can adapt far faster and are better financed than many of the investigative agencies arrayed against them. The latter are largely out-gunned, out-manoeuvred and hamstrung by bureaucratic red tape. Investigations stop where borders begin. The Laotian Government – which sent a delegation to this week’s wildlife crime talks in London – remains silent about Vixay’s activities and there seems to be little interest or will on its part in taking any action against him. His political ties – which, in the past, have reportedly even seen him accompany a former Laotian Prime Minister on an official state visit to Vietnam – have held him in good stead. The terrifying truth is that Vixay is one of very few wildlife crime “kingpins” that we have been able to identify. That he was identified at all was largely thanks to his own hubris and the arrogance and rank stupidity of key figures in the Xaysavang network who left behind a damning digital trail of evidence. We know where Vixay lives. We know who works with. Yet he remains untouchable. If we can’t reach him, then who can we reach? There are countless other syndicate bosses whose names we don’t know. They remain well below the radar and continue to feed a seemingly insatiable market for contraband wildlife products. In South Africa, where I live, more than 2,600 rhino have been lost to poachers since 2008. That is 10 times the number poached in South Africa in the preceding 27 years. Elsewhere in Africa, tens of thousands of elephants are being slaughtered every year. The killing is relentless. Lions, tigers, pangolins, reptiles, primates, birds and forests – to name but a few – are being cut down on a frightening scale. Time is fast running out. In fact, it has run out.